$5,499.00 This may be in stock for quick delivery; please call! Metallica's Kirk Hammett is fascinated by the strange and macabre aspects of life, evidenced by his custom guitars featuring classic horror art and paranormal phenomena, most famously seen in his well-known Ouija guitars. The next step in his LTD Signature Series is the KH Demonology, a guitar powerful enough to summon the mightiest of dark forces. Over its black finish are a number of sigils, which are ancient symbols reputed to be imbued with magical power that allows the owner to summon demonic entities. Whether or not you use the KH Demonology as a portal to magical dimensions, it's an amazing musical instrument in its own right. The KH Demonology is a neck-thru-body design at 25.5" scale, with a comfortably contoured alder body, an extra-thin U-shaped three-piece maple neck, and a pau ferro fingerboard inlaid with Kirk's skull-and-crossbones motif, along with 24 extra-jumbo frets. A set of active EMG 60 (neck) and EMG 81 (bridge) pickups provide a range of tones that go from deep and rich to super aggressive with the flick of a toggle switch, and each pickup has its own volume control. 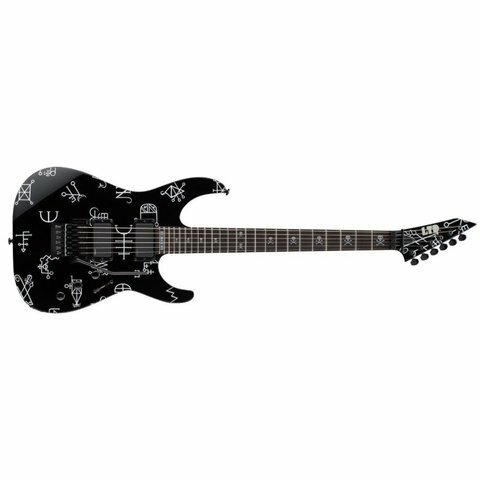 The KH Demonology includes a Floyd Rose tremolo for expressive performance styles, and comes with a special Tombstone case, appropriate for this unearthly tool of musical mayhem.